David is the ideal choice of entertainment for your wedding day. His outstanding style of magic is highly impressive. 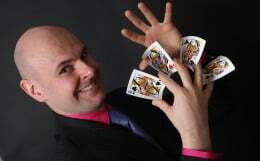 If you are organising a special party in Chesterfield, magician David Fox is the entertainer you are looking for. Magic Circle magician David Fox is a fine choice of corporate magician for business events in the Chesterfield area. Looking for wonderful world class magic in and around Chesterfield? Local Magic Circle magician David Fox is always delighted to perform magic in and around the beautiful town of Chesterfield. Reactions to his wonderful brand of magic are unfailingly spectacular in this picturesque East Midlands market town. Recent performances of his unique brand of magic have included a wedding performance at Casa Hotel on Lockoford Lane, match day entertainment at Queens Park Cricket Ground, and a virtuoso display of close-up sleight-of-hand at a student awards ceremony at Chesterfield College, Infirmary Road. 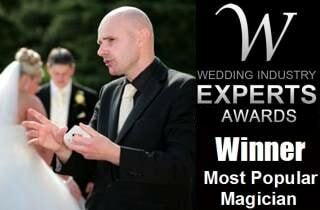 In 2014 David Fox was proud to be awarded the accolade of 'Most Popular Wedding Magician' by the Wedding Industry Experts. Receiving the most votes for a wedding magician worldwide demonstrated how highly David Fox is regarded within his field of entertainment. For parties, corporate functions and wedding day celebrations, Mr Fox's brand of sensational illusion is truly second-to-none. David's impressive client list includes many of the top brands located in Derbyshire such as Toyota, Hilton Hotels and Towergate Insurance. Contact David Fox today for more details about how he can turn your next event in and around Chesterfield into something truly unforgettable.